And, today’s YA author in the spotlight is CARIDAD FERRER. Enjoy! AUTHOR: (this information is from the author’s website www.caridadferrer.com and her author page on amazon.com) Barbara Caridad Ferrer is a first generation, bilingual Cuban-American, born in Manhattan and raised in Miami. Her young adult debut, ADÍOS TO MY OLD LIFE won the Romance Writers of America’s 2007 RITA for Best Contemporary Single Title Romance. It was also named to ALA’s 2009 Popular Paperbacks for Young Adults list. Publisher’s Weekly said this about her second YA novel, IT’S NOT ABOUT THE ACCENT: “…this twisting book amply rewards readers.” She has also contributed to the anthology FIFTEEN CANDLES: 15 TALES OF TAFFETA, HAIRSPRAY, DRUNK UNCLES, AND OTHER QUINCEAÑERA STORIES and is a regular contributor to Romancing the Blog (www.romancingtheblog.com). 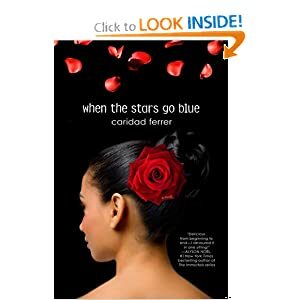 YA NOVEL: WHEN THE STARS GO BLUE, a contemporary retelling of Bizet’s CARMEN. FROM THE BOOK JACKET: Dance is Soledad Reyes’s life. About to graduate from Miami’s Biscayne High School for the Performing Arts, she plans on spending her last summer at home teaching in dance studio, saving money, and eventually auditioning for dance companies. That is, until fate intervenes in the form of a fellow student Jonathan Crandall, who has what sounds like an outrageous proposition: Forget teaching. Instead, why not spend the summer performing in the intense environment of the competitive drum and bugle corps? The corps is going to be performing Carmen, and the opportunity to portray the character of the sultry gypsy proves too tempting for Soledad to pass up, as well as the opportunity to spend more time with Jonathan, who intrigues her in a way no boy ever has. But in an uncanny echo of the story they perform every evening, an unexpected competitor for Soledad’s affections appears. One explosive encounter later, Soledad finds not only her relationship with Jonathan threatened but her entire future as a professional dancer in jeopardy. MY TWO CENTS: While reading this, I could easily see how Ferrer won a Romance Writer’s award. The relationship between Soledad and Jonathan is hot, hot, hot. The romance grows complicated when another cutie, Taz, enters the story and Jonathan becomes increasingly jealous and possessive of Soledad. The story’s tragic turn leaves Soledad’s heart and body broken, but rest assured, the ending is happy and oh so sweet. Ferrer’s writing also shows some love for Miami, music, dance, and drum and bugle corps, with rich descriptions of each throughout the novel. Find WHEN THE STARS GO BLUE on Amazon.com and Goodreads.